A.Vogel Dormeasan Sleep is a traditional herbal medicinal product for use in the temporary relief of sleep disturbances caused by the symptoms of mild anxiety, exclusively based upon long-standing use as a traditional remedy. 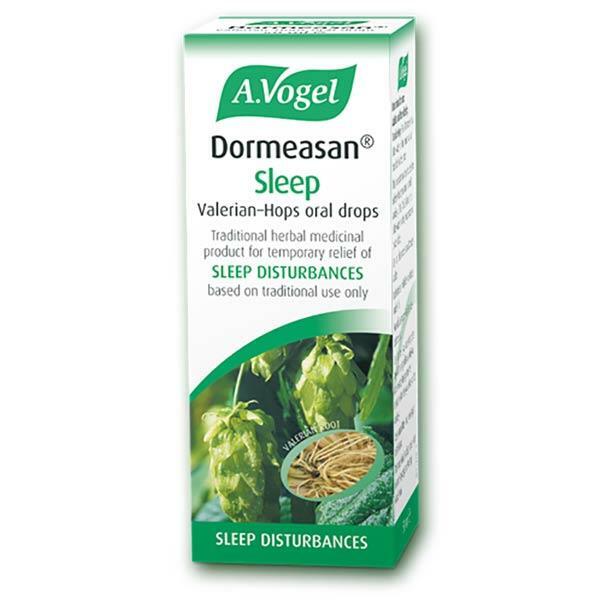 Containing organically grown Valerian root and Hops, A.Vogel Dormeasan is a natural sleep remedy that can provide temporary relief of sleep disturbances. To aid sleep: Adults - Take 30 drops in some water approximately half an hour before bedtime. To aid mild anxiety: Adults - Take 10-20 drops in a small amount of water once or twice daily. 1ml of Dormeasan® oral liquid (equivalent to 35 drops) contains: Valerian root tincture 0.5ml (Valeriana officinalis L.) (1:10-11) Extraction solvent: ethanol 58%v/v Hops strobile tincture 0.5ml (Humulus lupulus L.) (1:12-13) Extraction solvent: ethanol 65% v/v. Other ingredients used are ethanol and water. The following minor side effects can occur when using this product: feeling sick, stomach discomfort. These are often short-lived and should go away by themselves. However if they are troubling you, talk to your doctor or pharmacist. If you are concerned about any side effect or if you notice any side effects not listed in this leaflet, please tell your doctor or pharmacist. This product is intended to help you fall asleep. If you feel drowsy, do not drive or operate machinery. The effects of the product may be increased by alcohol. Excessive use of alcohol should therefore be avoided.